While you can test your water for aluminum at home, the results will only tell you if heavy metal is present in the water, not how much is present or whether your water is safe to drink. To get accurate results and ensure the safety of your family, have your water tested in a laboratory with the necessary equipment. You can take the water sample yourself, as long as you use an uncontaminated collection bottle and fresh water from a disinfected source. Send your water sample to a laboratory for professional, accurate results. You can take a sample from a faucet that does not swing after removing the aerator. Add 1/2 cup of bleach to a measuring cup and dip the end of the faucet in the bleach to sanitize it. Turn on the faucet and clear the line by letting the water run for at least five minutes, or as long as necessary to pull fresh water through the piping. With a sterile collection bottle and screw-on cap, collect the water midstream. Do not touch the inside of the bottle, the inside of the cap or the opening at all. Cover and store the water in the refrigerator for mailing to a lab unless you plan to conduct a home test. Test strips allow you at home to analyze the water for the presence of aluminum. The test requires you to dip the strip in a water sample that has a reagent added to it, or by adding a reagent to the strip, depending on the kit you have. After the strip changes color, you compare it to a chart to determine whether aluminum is present. If it is present, you can escalate to a laboratory test to pinpoint the precise level. The World Health Organization and U.S. Food and Drug Administration recommend that you consume no more than 0.2 milligrams per liter of water. Aluminum is usually not present in water unless there are high levels of underground bauxite, an aluminum ore, aluminum-bearing clays or industrial waste from nearby mines. 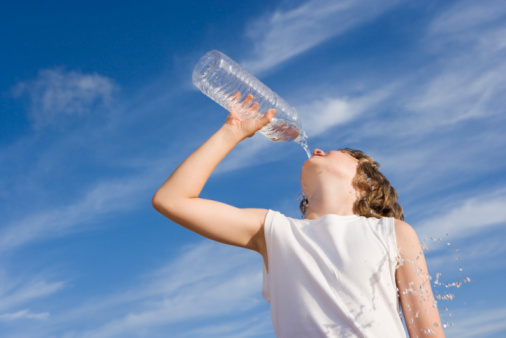 Contact your local water supplier for a water quality report, if you do not have a well. Before you and your family drink water from a recently dug well or one in a new-to-you home, contact a water treatment professional to conduct regular water tests to determine what is present in your water, as recommended by the EPA. Many professionals have kits that allow them to test the water that give them an idea of your water's makeup. But these tests, like the test strip, do not conclusively indicate how much aluminum is present in your water. For more exacting results, the water treatment professional sends the sample to a laboratory to have your water fully analyzed. This helps him devise a treatment option geared to the water in your well. Take another water sample, or use the stored refrigerator sample and mail it to a laboratory within 48 hours or sampling. Many laboratories offer water quality analysis test kits that provide you the materials and instructions to take a sample and mail it back. Most labs test for multiple heavy metals at one time, along with iron, minerals, chemicals and bacteria, not just aluminum. Contact your local health department, as it should have a list of state-certified and licensed laboratories in your area.